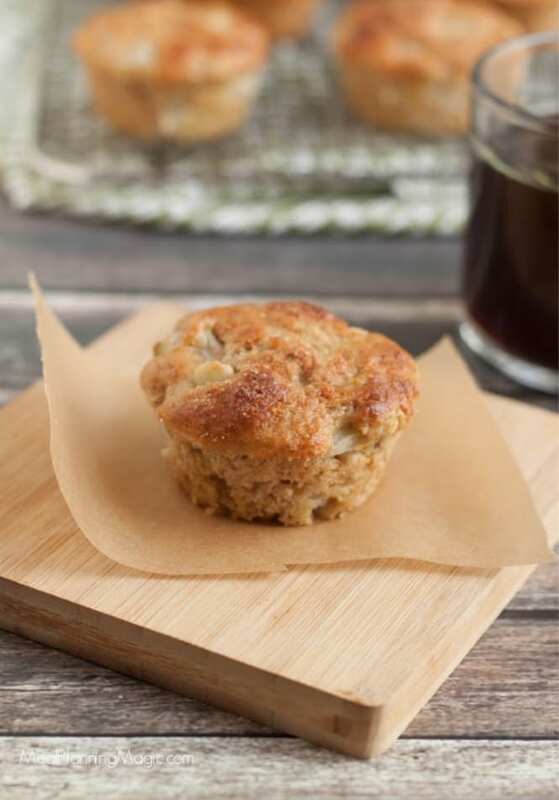 Delicious and healthier Pear Walnut Power Muffins are made with fresh pears, Greek yogurt, walnuts and more to power you through your morning or snack time. Y’all! 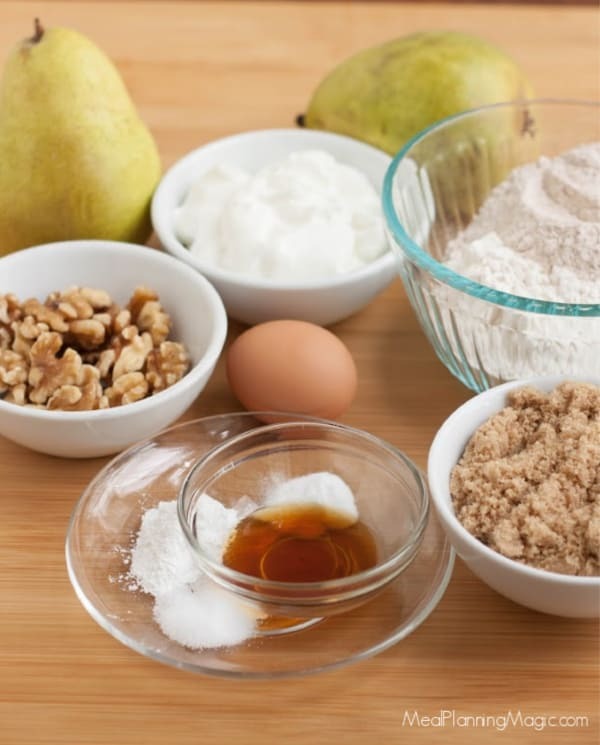 I have been making these Pear Walnut Power Muffins for almost a decade now and they remain one of my family’s all time favorite muffins. They seriously are consumed in minutes! 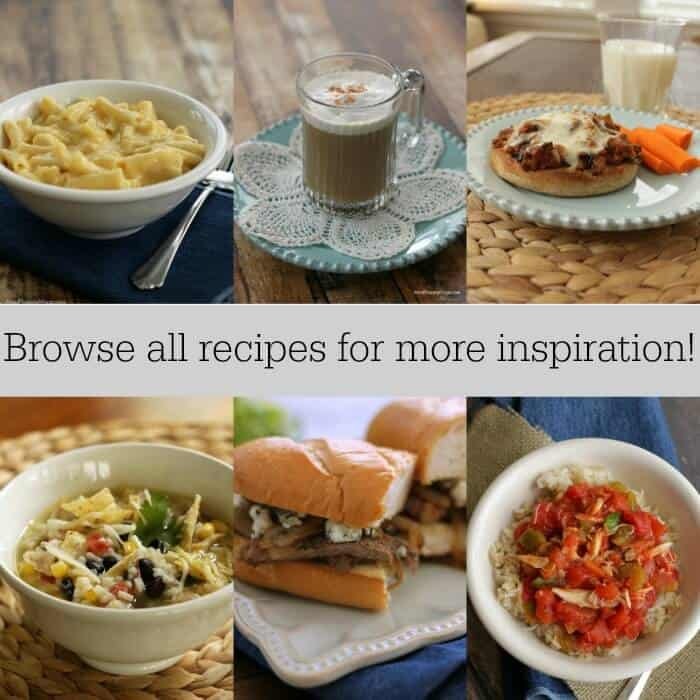 I originally shared this recipe here back in the spring of 2012 but I’ve updated the post (which was pretty short before) and added new photos to reshare again with you all because they really are that tasty! There is so much to love about them. 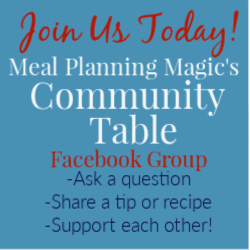 I originally got this recipe from a Cooking Light magazine and they were a hit right away. I tweaked the recipe slightly to make them my own. 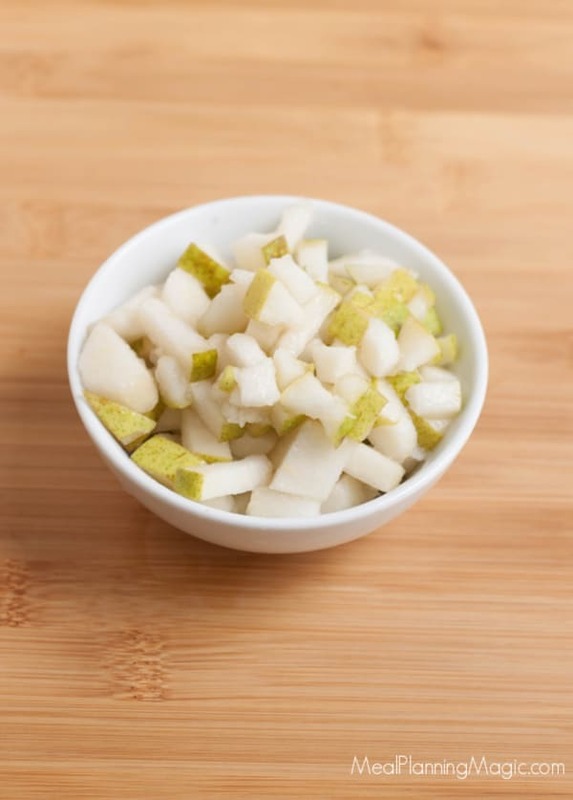 They are filled with all kind of wholesome ingredients starting with fresh, ripe pears which are in season in the fall and winter. What I also like about them is that they use only two tablespoons of oil and use the power of plain Greek yogurt to help with moisture and help these muffins rise to make them moist and delicious. I love that they also include finely chopped walnuts which add a great flavor that you don’t often find in other muffins. The trick is to finely chop them so that they blend in well into the muffin. I like to use my food processor or Vitamix blender to get them really fine. I also keep a bag of whole, shelled walnuts in my freezer year round so that I can use them in other recipes. I buy the big bags from Costco or Sam’s Club because they are such a better value that way! One tip I have for filling your muffin tin cups so that they bake evenly is to use a large scoop. I use different sized scoops in the kitchen all the time! I fill the large scoop nearly full and that fills my muffin cup about three-quarters full which lets them have a nice crown on top. 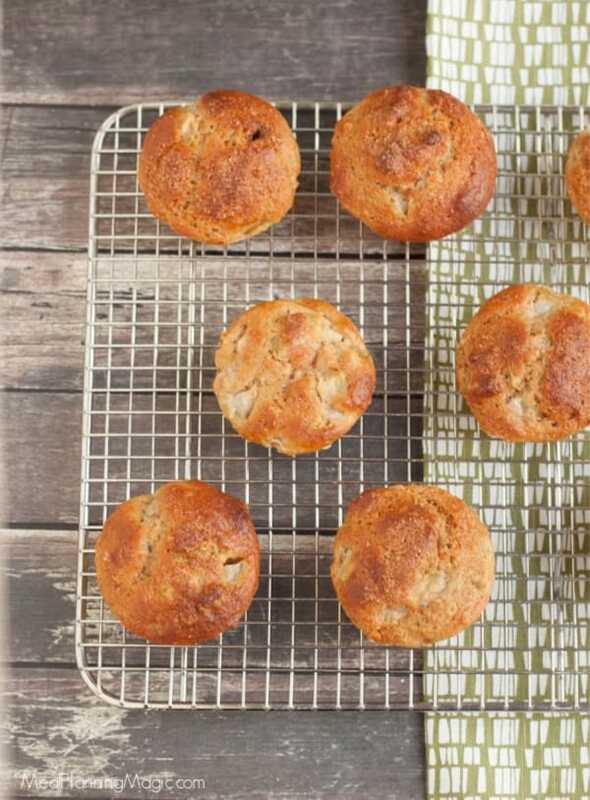 With pears, yogurt, walnuts and whole wheat flour, that’s why I call them power muffins because those wholesome, nutritious ingredients are just a bonus to these super flavorful muffins. 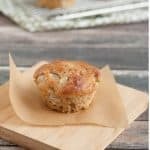 These Pear Walnut Power Muffins are great with a cup of coffee in the morning or just about any time of day. I will often make a double batch to keep some in the freezer. They heat up beautifully in the microwave from frozen—perfect for when on the go! Preheat oven to 400°. Spray 12-cup muffin with cooking spray. You will also need an extra muffin tin with just three cups sprayed. 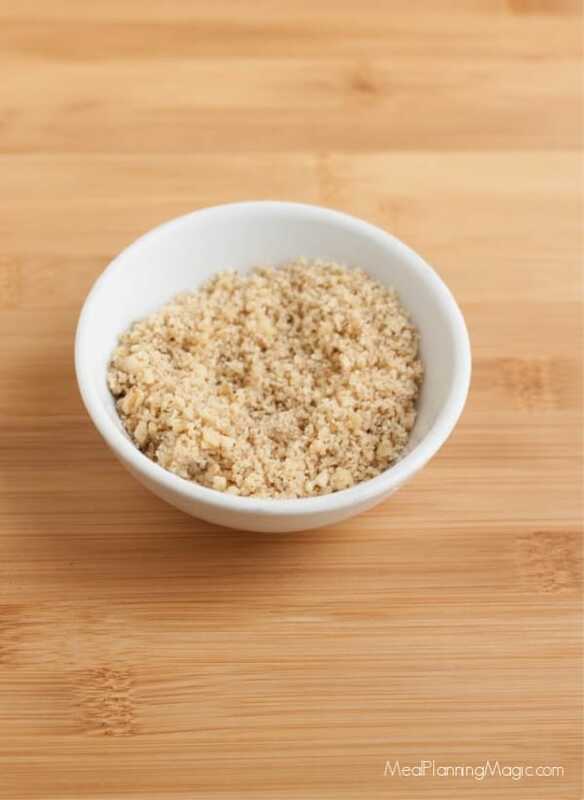 Place walnuts in a food processor; process until finely ground. Set aside. 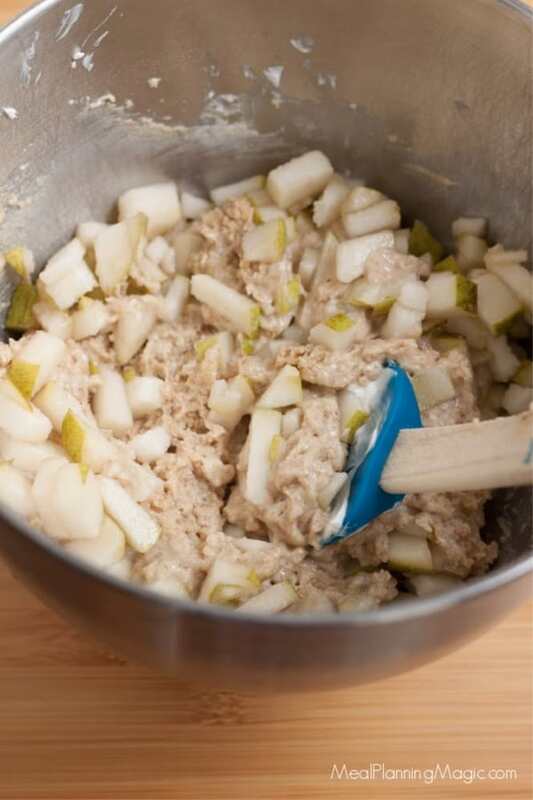 In a large bowl, combine flours, baking powder, baking soda and salt. Stir well with a whisk. Stir in ground walnuts. Make a well in center of mixture. 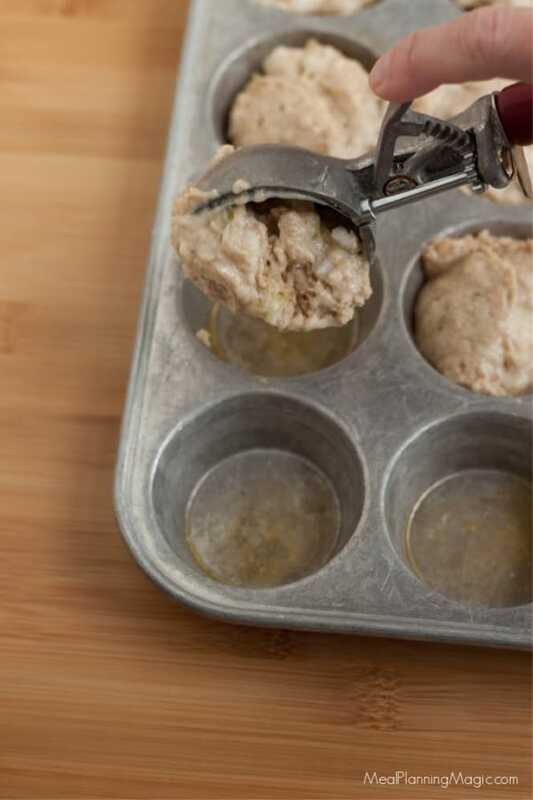 Using a baking scoop or large spoon, fill muffin cups 2/3 full with batter. Sprinkle batter with turbinado sugar. Bake at 400° for 20 minutes or until muffins spring back when touched lightly in center. Remove from pans immediately. Place on a wire rack. Serve either warm or at room temperature. Recipe adapted from Cooking Light recipe. Sounds good! I love pears. I made these today and replaced the walnuts with almonds and they were delicious. I love that they freeze well too, as I hate when things go to waste. Thank you for the great recipe! I am so glad that you enjoyed them, Crystal! Swapping out the walnuts for almonds sounds delicious–I will have to give that a try sometime too!